Department of Mechanical Engineering, Visvesvaraya National Institute of Technology, Nagpur, India. This paper deals with the study of joint clearance on kinematics of mechanism and bearing stiffness along with links flexibility on modal analysis at higher frequency. 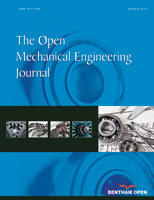 Literature survey reveals that the studies were carried out for highspeed mechanism considering linkage flexibility without considering bearing stiffness. The method of calculating clearance at joints, checking for orientation of linkages and estimation of exact mechanical error using sensitivity analysis is discussed. An attempt is also made to analyze the actual dynamic performance of mechanism by determining natural frequencies of flexible mechanism at high speed considering the effect of bearing stiffness. Bearing stiffness depends upon speed, bearing load and also on wear, out of run, play etc during operation. It is observed that as the stiffness of joint increases natural frequency also increases and converges when stiffness reaches a value close to 1.6x109N/m.